With custom designed components, this kit covers all the subject areas two or three individual kits usually address. Everything necessary to perform 15 different activities is included in one convenient package. A teacher’s manual accompanies the kit with a full description of activities, reproducible student sheets, and teaching tips. A CD is also included with slide presentations of each experiment that can be performed. 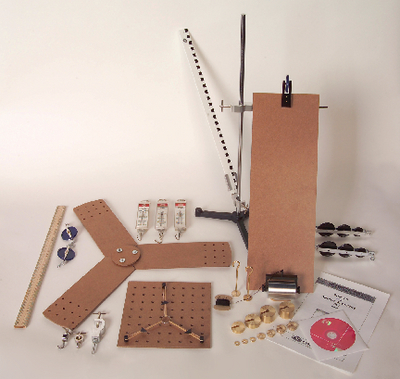 Ordering information: This kit includes a force board, an inclined plane, and a vector board along with a complete set of accessories, including pulleys, spring scales, levers, and a teacher’s manual.